President Donald Trump lambasted Amazon on Twitter early Wednesday morning, accusing the e-commerce juggernaut of causing job losses throughout the U.S. and doing “great damage” to retailers. Amazon shares dipped briefly by 1 percent. The billionaires bickered throughout Trump's presidential campaign, with Trump saying Amazon was “getting away with murder tax-wise” and accused it of using the Washington Post as a way to cozy up to politicians. He also railed on the company in June, again accusing Bezos's empire of shirking tax responsibilities. While there is no such thing as an “internet taxes,” there is a sales tax that e-commerce sites must pay in states where they have a physical presence. With Amazon’s nationwide network of fulfillment centers, the company now collects taxes in all 45 states that have a sales tax. Yet tax avoidance is an issue that has dogged Amazon for years. Although the company currently has a $460 billion valuation, it claims to have low profits due to its "highly competitive, low-margin business." 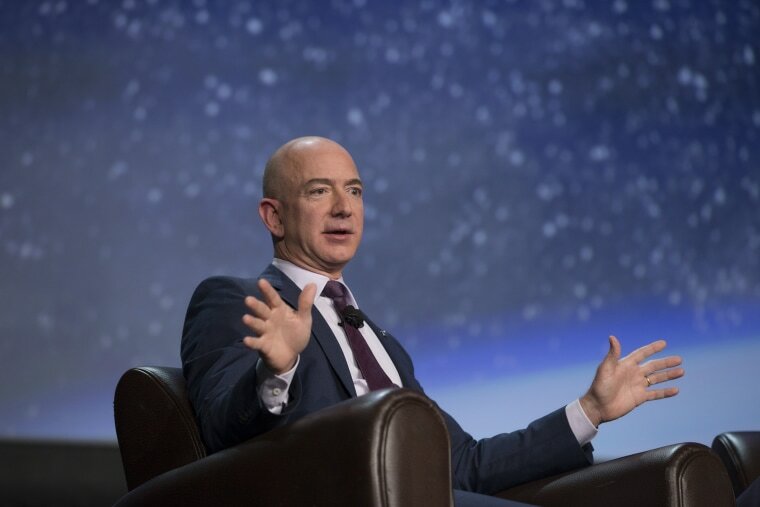 After Trump won the election, Bezos softened his stance towards the billionaire businessman and president-elect, wishing him "great success" and offering him "my most open mind." Bezos even joined other tech titans, including Apple CEO Tim Cook and Microsoft's Satya Nadella, at a June White House meeting to discuss how to make government systems run more efficiently. A photo from that event was widely circulated, prompting much mirth on social media. While the national retail landscape continues to depopulate amid the growth of online shopping, not everyone is ready to write off the brick-and-mortar experience — Amazon itself opened a seventh physical book store in June.